Craft Guild members will agree to adhere to the rules and regulations laid out in their Craft Distillery Agreements with the Province and the LCLB. Craft Guild members will only speak positively about their colleague Craft Guild distillers or other distillers when addressing the public or public media institutions. Craft Guild members will not use comparative statements when marketing their products (i.e. Better than brand x, or Vancouver’s best distillery, etc.). If a Craft Distillery receives awards they may use that in their advertising but must reference the context. (i.e. Voted Vancouver’s best gin and tasting room: by the Vancouver Sun). All products must be truthfully labeled as not to deceive the public. 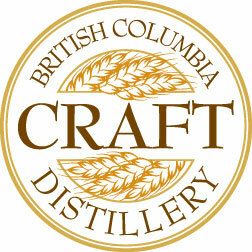 Guild members will agree to only use the word “Craft Distilled” or “100% BC…” if they have attained the Craft Distillery designation by the BCLCLB and are distilling under those set of rules and regulations as for now “Craft Distilling” in BC has been defined by the province as being fermented and distilled onsite using 100% BC base fermentable materials. Any marketing of product of of the guild members distillery or online presence must also be truthful in relation to utilization of the wording of “Craft Distilled” or “Craft Distillery”, or “100% BC”. Guild members will agree to conduct themselves in an ethical and professional manner at all times when working within, talking about, or representing the Craft Distillers Guild, the profession or the industry as a whole, especially in consideration of how it pertains to the public and our collective reputations. We strictly adhere to the British Columbia Craft Distillers Code of Conduct. This ensures you get exactly what you’re expecting when you purchase any of our small-batch, micro-distilled products. To learn more about the Craft Distillers Code of Conduct, Dragon Mist Distillery or to arrange a sample tasting of any of our spirits or liqueurs, please feel free to contact us at any time.